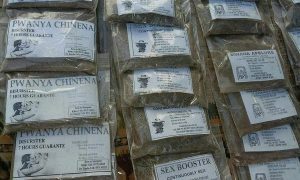 ZAMBIA – A man of Chief Chikuwe’s area in Chipangali district has died after taking sexual boosters to enlarge his manhood. Eastern Province Police Commissioner Luckson Sakala said a known herbalist who administered the sexual boosters to the victim, is being held in police custody to help the police with investigations. Sakala said the victim Timothy Onde became unconscious after taking the sexual boosters and that he was pronounced dead upon arrival at Muzeyi health center yesterday at around 23 hours. The Police Commissioner told journalists in Chipata that the herbalist has been charged with murder, until the post-mortem is conducted. He said the police will further be guided after the postmortem results.